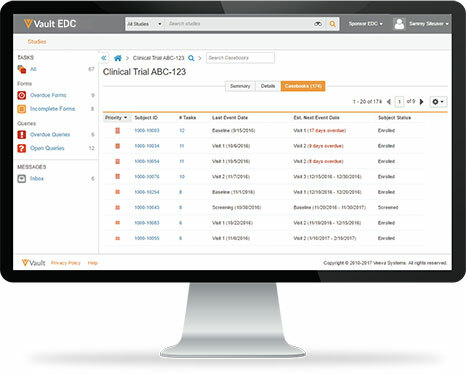 Vault EDC provides a fast and intuitive interface for capturing and reviewing clinical trial data. Designed for flexibility, Vault EDC allows you to run complex multi-arm adaptive trials and make mid-study amendments without downtime or migrations. Veeva is delivering a better EDC that lets you run the trial you want. Accelerate study cycle times: Deploy studies in weeks not months. Run the study you want: Build your database for complex, multi-arm trials with less time and effort, and make mid-study design amendments with no downtime or migrations. Get clean data faster: Drive efficiency in data cleaning and improve time to database lock with a flexible, formless view of your data that is optimized for monitoring and review. Connected clinical: Part of a comprehensive clinical suite that includes Vault CTMS, Vault eTMF, and Vault Study Startup. Veeva’s expert services team delivers fully configured studies to sponsors and CROs. Innovative features such as a rules engine for edit checks, drag-and-drop form design, and self-documenting spec creation enable Veeva to build studies quickly and efficiently. A modern user experience greatly increases usability, adoption, and performance. During data entry, real-time auto-saving and edit checks increase accuracy and user satisfaction. The quick-jump navigation reduces time spent navigating between subject casebooks, events, and forms. Personalized user interfaces provide immediate direction of users’ tasks and minimize time spent searching for information. The role-based user interface optimizes the order and structure of data differently for data entry verses data cleaning and review to provide the ideal view for each activity. Vault provides an elegant migration-less approach to EDC design changes for in-flight studies. When new requirements are added, any completed forms are reverted to an incomplete state and the new fields are flagged for site personnel to populate. Read more about Veeva’s approach to migration-less casebook amendments. Direct access to study data and self-serve reports accelerates decision making by helping you identify trends and safety signals faster. Access also improves trial execution by removing barriers to sponsor and CRO collaboration. A scalable cloud platform that is easily accessed by sponsors and CROs, provides both parties with direct access to the data. And as a true multitenant platform, Vault delivers a rapid pace of innovation with three releases per year. Leverage select operational data from Vault CDMS for reporting within Vault CTMS. CTMS users can report on the status of subjects and dates captured in Vault EDC, as well as navigate to a subject’s casebook in Vault EDC.